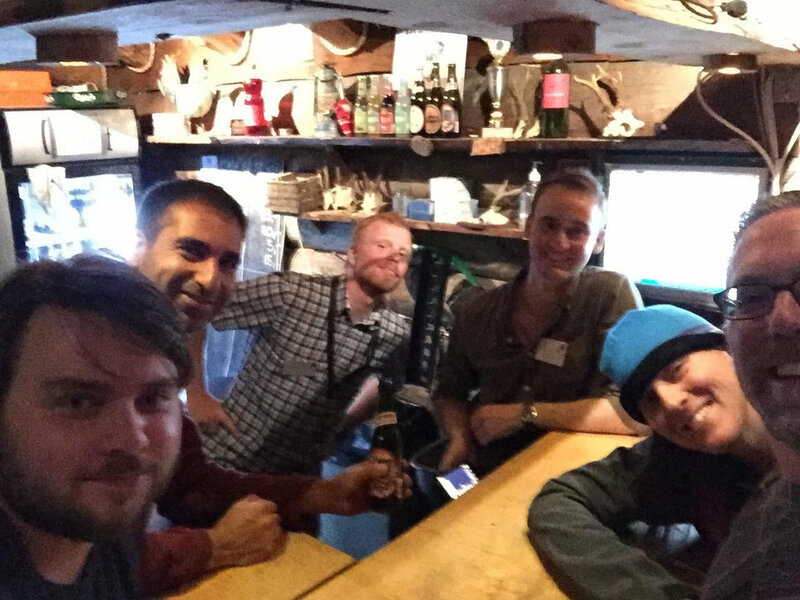 Another Wonderful QGIS Conference/Hackfest/Developer Meeting in Denmark!!! There's something notable in Nødebo. From August 2-10 The third QGIS User Conference, Hackfest and Developer Meeting was held in Nødebo Denmark at the University of Copenhagen – Forest and Landscape College (Københavns Universitet Skovskolen). I was fortunate to attend, as I did in 2015. The first two days were the users conference, then there was a 3 day hackfest followed by 4 days of workshops. It was another intimate meeting with 120 people from 29 countries and 6 continents! My wife and I were the only Americans to attend the user meeting. It was really nice to have my wife and business partner along. This in fact became a theme of the meeting. Many brought their spouses/partners and kids. It felt more like a QGIS family gathering than a "conference". Since we are all staying on a small campus and eating all our meals there, it creates a real bonding atmosphere. There were numerous opportunities to connect with others throughout each day. It is the best community building atmosphere I've experienced at a conference. The QGIS family is very warm and inviting. I think this is part of the reason QGIS is such a successful project. I got to catch up with old and dear friends/colleagues and meet many new ones. Many of the talks were given by developers and we were updated on the state of QGIS. Topics included QField (Matthias Kuhn and Marco Bernasocchi of OpenGIS.ch), a native QGIS 3D renderer (Martin Dobias of Lutra Consulting), the InaSafe plugin (Tim Sutton of Kartoza), QGIS Web Client 2 (Andreas Neumann). There were some short workshops in this section including a nice overview of LASTools by Martin Isenburg. Then Nyall Dawson (North Road) gave a truly memorable presentation Exploring the Depths of Madness with QGIS Symbology that I'm still trying to wrap my brain around. Interspersed throughout the program were many presentations highlighting local initiatives involving QGIS and several research projects. Tim Sutton just authored a much more complete accounting of the talks at the conference with video clips. You can find it here. The environment at the Skovskolen is full of the feeling of Danish hygge. This is largely due to the hard work and gracious hosting of Lene Fischer. The meals are better than any I've had at any other conference by a large margin, and the local staff and students are warm and welcoming. We had a chatted with students Asbjørn, Ras and Frederik. Each night there was a gathering at the local watering hole Flaeken, with nail game challenges and fuzboll. I miss the nail game. It's a Skovskolen tradition involving pounding nails into a large stump. On the final day I taught a full day workshop on Cartography and Data Visualization in QGIS. The attendees were from 9 different countries. What I gave was a tour of the many great data visualization tools available in QGIS. I covered the print composer introducing some tips and tricks along the way and a section on Atlas generation. I then covered the many renderers now available, highlighting the 2.5D, Geometry generators, point displacement and showing some use cases for the popular inverted polygon shapeburst fills. I also covered some plugins such as QGIS2ThreeJS and the Time manager and use cases for different Blending modes. I sadly missed the group photo taken near the end of the hackfest taken by Maryanne Dawson. Sarah and I took some days in the middle to have a holiday. We rented a place in Copenhagen and flew to Oslo one day to visit the Viking Ship Museum. To top it off, on the final night Sarah and I were taken to a performance of Hamlet at Kronborg Castle. This is the castle that was the model for Elsinore in Hamlet. The performance was phenomenal including some interesting modern elements like cell phones and helicopters. If that weren't enough it was staged right next to the moat outside the castle complete with swans and full moon rising. There was nothing rotten in Denmark and I cannot wait until next time! From there we flew to Boston to attend FOSS4G. I'll report on that next!